Since 1987 we have proudly entertained our community. Christmas on the Air is returning for 2018! Planning has begun for The Walpole Players’ Seventh Annual production of Charles Dickens’ classic tale A CHRISTMAS CAROL. Presented again as a benefit, The Walpole Players have now raised over $20,000 for local food shelves. This year’s production will be presented Wednesday through Saturday, December 10, 11, 12, and 13, 2014, in the Helen Miller Theater at the Walpole Town Hall. Auditions for this year’s production will be held Thursday and Friday, November 6th and 7th with rehearsals beginning on Sunday, November 9th. To assist in your planning the full rehearsal schedule for 2014 has been posted on our website — http://thewalpoleplayers.org Look for the link on the right to A CHRISTMAS CAROL – 2014 – CAST INFORMATION (or click on this link). 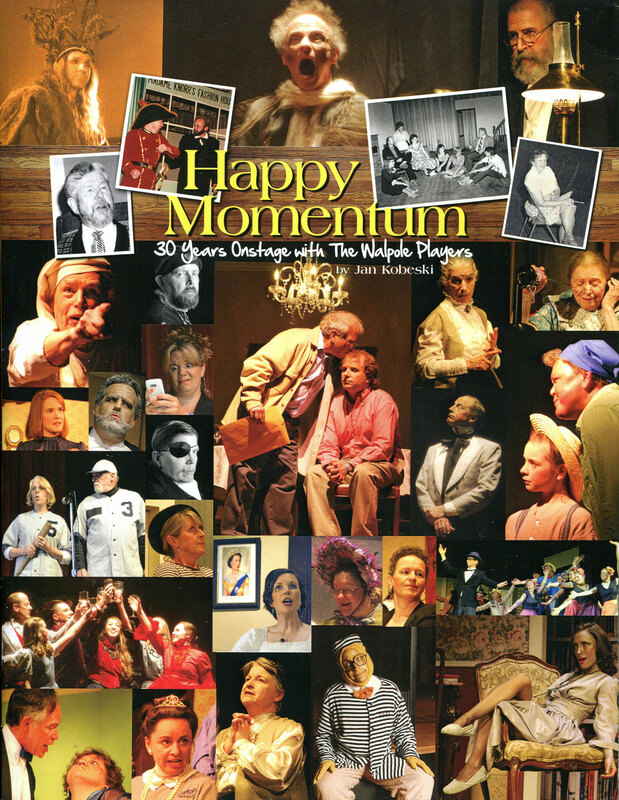 Happy Momentum: 30 Years Onstage with The Walpole Players, by Jan Kobeski. A collection of posters, programs, photographs and related ephemera on all 30 years of productions, the Junior Players, Theater Camp, A Christmas Carol, and more. This 88 page full-color book takes you through a nostalgic memory filled trip of Players’ history. Priced at $15, copies are available at Joanie Joan’s Baked Goods Company on Westminster Street in Walpole. If you would like a copy mailed anywhere in the US for $20, contact Ray Boas, or make arrangements at Joanie’s. The Reviews are in and LOST IN YONKERS is a hit! Mark your calendars now for the 7th Annual Cabin Fever Radio Follies! Christmas on the Air returning for 2018! Please sign up to follow The Walpole Players. Enter your email address to follow this blog and receive notifications of new posts by email. Type your address in the box below and click on follow.